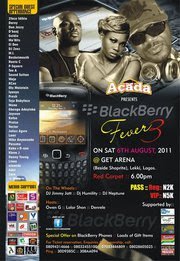 Preparation is already in top gear for the third edition of the Acada Blackberry Fever Summer Party billed to hold at the popular celebrity hangout, Get Arena, Lekki, Lagos come Saturday 6th of August, 2011. It should be noted that the party has been held in past times at the popular Tribeca on the Island and La Guliano, Ade-Oyo in Ibadan where the first and second edition of the party took place respectively. According to the publisher of ACADA, the first national and consistent youth magazine, Mr. Biodun Caston-Dada who stated that the essence of the gathering was to afford the users of BlackBerry Phones which constitute mostly of youths and campus students to converge under one roof to have fun bring and also to bring fun lovers together and create a platform for interaction. However, this year edition promises to be bigger and better as it is enjoying the full support of the telecom giant, MTN Nigeria who will be running a special promotion at the event. Guests will have a rare and unique opportunity of buying 1 BlackBerry phone and get another 1 for FREE!!! There will also be raffle draws and various competitions to spice up the event and guests will have the opportunity of winning various prizes like Laptops, LCD TVs, Mobile Phones, Recharge Cards, etc. Some of the celebrities and top artistes expected at the event include 2face, D’banj, P-Square, Asa, Darey, Julius Agwu, Basketmouth, Yvonne Nelson, Goldie, Rukky Sanda, Tonto Dike, etc. Behind the wheels-of-steel are top Nigerian DJs, DJ Jimmy Jatt, DJ Humility and DJ Neptune. The event will be hosted by Owen Gee, Lolar Shon and Denrele.